On October 18 Ubitus launched the GameNow cloud gaming service in the US. Verizon Wireless 4G LTE customers are the first with access to the Ubitus GameNow service. In particular users with the following Android 4G LTE devices on the Verizon Wireless 4G LTE network can subscribe to the service: Droid RAZR, Droid 4, Droid RAZR M, Droid RAZR HD, Droid RAZR MAXX HD. New devices in the Verizon portfolio that will support GameNow will be announced soon. Users have to install the GameNow App from the Verizon V CAST App store. Once the application is installed properly, users can use either their Facebook or Twitter ID to sign into GameNow. In December Ubitus plans to make the GameNow service available through the relaunched GameNow web page with GameNow subscribers able to use the same user ID to play their subscribed games directly from the website. This will enable Verizon Wireless 4G LTE users to stream console-quality video games through a wide array of devices, including PCs, Macs, Smart TVs, STBs, and other tablets and smartphones, all connected through the Verizon Wireless LTE and/or Wi-Fi networks. Ubitus GameNow is a cloud gaming service platform powered by Taipei, Taiwan based cloud gaming company Ubitus. It delivers on demand access to a growing library of console quality games. You can play the games on your LTE mobile device, your Android tablet, STB, Smart TV, PC or Mac, and take your console gaming experience with you wherever you go. The GameNow service allows you to try games before you buy them, and you can move your game from one device to another easily. Buy a game once and pick up your save games everywhere, simply by logging in. You can even start a game at home and continue on your tablet on your way to work or school. GameNow unleashes the power of cloud computing to deliver a mobile gaming experience like you've never seen it before if you're not one of the people who have tried the OnLive Android App before; the games you want, wherever you are, on the devices you have, all powered by the advancement of fixed and wireless broadband networks. Speaking of games, the GameNow games library is not huge yet by quantity standards as it currently only spans 16 games, but it makes up with quality as some of the games are quite the heavy hitters. The GameNow games library currently includes Resident Evil 5, Devil May Cry 4, Super Street Fighter IV: Arcade Edition, Street Fighter X Tekken, Lost Planet 2, Test Drive Unlimited 2, Ghostbusters: The Video Game, King’s Bounty: The Legend, The UnderGarden, Blade Kitten, Tycoon City New York, KAO the Kangaroo: Round 2, Haunted House, Flock!, Backyard Sports: Sandlot Sluggers and Backyard Sports: Rookie Rush. Looks like Ubitus and GameNow have strong support from Capcom and Atari, but they have a long way to go to build up a competitive games library. Since GameNow is first geared towards mobiles, Ubitus has crafted some elaborate controls for the games being streamed from the cloud to gamers. 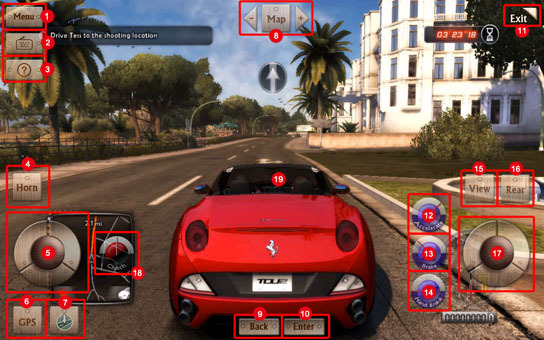 Some clever touch controls are in use adapted for each game specifically, with some games even using the movement input and tilt of the mobiles. Rockstar has done something similar for the OnLive version of L.A. Noire, but Ubitus is doing it on a platform level which is something that OnLive should take notice of, of course as noted the GameNow games library currently only spans 16 games which is still less than OnLive's touch enabled games library. As with the OnLive touch games, some games work better with touch and some worse which isn't surprising as many of the games were designed with controllers and the classic keyboard and mouse control scheme in mind. The quality and latency of mobiles' touch controls is getting better and better, but the question remains if this will be enough for games that have complicated control schemes and were designed for physical controllers. OnLive has been to date regarded as the by far biggest cloud gaming service in the US, it's debatable if they are the biggest around the globe. Ubitus for instance is already powering the LG U+ C-games cloud gaming service in South Korea, they will also help building a cloud gaming service for China Telecom and have released a game development kit. With the launch of Ubitus GameNow OnLive's superiority in the US could end soon as Ubitus already has the support of Verizon, with the possibility of the other US carriers also adopting the service. I'm sure OnLive's biggest rival in the cloud gaming arena to date Gaikai would also love to have a say in that, though they are now under Sony's umbrella until Sony actually launches a PlayStation cloud gaming service with the Gaikai tech they are not regarded as a serious contender. Ubitus GameNow uses the Ubitus GameCloud technology that is able to render games requiring high-end graphics computing on servers in the cloud and streaming videos of the gameplay to gamers. Ubitus has partnered with NVIDIA which shows as the GameNow web page exhibits a similar color palette to NVIDIA's branding. Coupled with NVIDIA's Geforce GRID cloud gaming technology and the Kepler GPU architecture, GameCloud is capable of more game concurrencies and less power consumption. Without any download or installation, end users can easily enjoy cloud-based games anytime, anywhere through a pre-bundled interface on their PCs, Macs, Smart TVs, STBs, tablets and smartphones. "We have worked closely with NVIDIA to use the Geforce GRID processor architecture in Ubitus GameCloud. Ubitus delivers highly scalable cloud gaming solutions with a native-like gaming experience for service providers," said Wesley Kuo, CEO of Ubitus. Seeing as how the various cloud gaming services springing up around the world use NVIDIA's Geforce GRID cloud gaming technology, NVIDIA must feel pretty happy and proud for their foresight to go with guns blazing into cloud gaming so early in the game. In September a report surfaced that the big US telecom carriers including Verizon are working on their own cloud gaming services. With the launch of GameNow on Verizon Wireless, it looks like that report was correct. It's not yet known if other carriers will also use the Ubitus GameNow service. I'm very curious which US telecom carrier will launch their cloud gaming service next. GameNow Cloud Gaming Service is really useful for game download. GameNow Cloud Gaming Service is really awesome and beneficial. Thanks for informing about GameNow Cloud, it's a really awesome game. it is very useful post! thanks for giving nice information.